According to Jack Cogswell, there was no choice but to create the Mariner Yacht Company in east Rochester in 1976 because he was dissatisfied with the way most boats were being built. To Cogswell, they were coming off the assembly lines like bleach bottles---so many indistinguishable pieces of fiberglass floating in the water. Their interiors reminded him of hospital wards. In 1976, a little bit of Jack Cogswell in a 28-foot sailboat went for about $22,000. In 1981, a new 28-footer costs about $54,000. 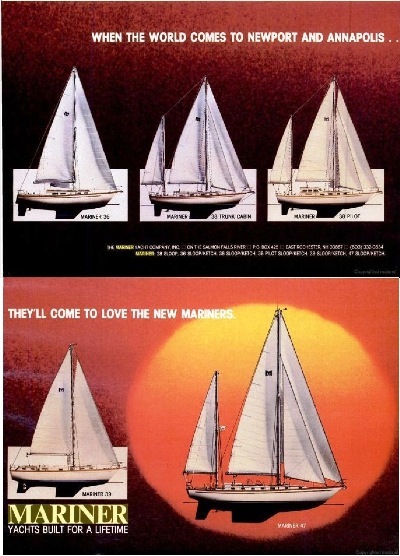 In the intervening years, Mariner had introduced a 36-footer, a 38-footer, a 39-footer and, a 47-footer that sold for just over a quarter of a million dollars in 1981. In the process, Mariner has gone from a company that sold boats to middle managers to a company that sells boats to professionals with six-figure incomes, from a company that sold luxury sailboats to a company that sells yachts. "We're moving more and more in that direction," agrees John Banghart, Mariner's marketing director. "We're building boats that are customized. This is a competitive business, and you have to do something different from the other guy, something unique. We feel better working one on one. That is our niche." Part of what the customer is paying for is craftsmanship. Jack Cogswell likes to say that he sells man-hours, not boats. The typical 36-footer takes Mariner 2,000 man-hours and about four weeks to build. The 47-footer can take up to 6,000 man-hours, and from three to four months to complete. The work is done by Mariner employees at two different sites, a molding plant in Farmington, and an assembly plant in East Rochester. In Farmington, 17 men turn out gleaming white fiberglass hulls. The work is slow and not especially pleasant. The men must wear masks to prevent them from inhaling fumes from the fiberglass. The crew can finish a hull in about 5 days. In East Rochester, about 60 people do the woodworking and assembly. The factory building is divided into sections. In one room, about a dozen men shape, cut and build the wooden pieces of the boat. They work with only the finest materials --- teak, mahogany, cedar, and plywood from the Philippines. Banghart points to a teak cabinet door that he says cost $1,000. He then points to a finely carved wooden hand railing. "We'll get a vendor in here who will say he can sell us the rail for less," Says Banghart. "We'll say, sorry we'd rather pay more and assure ourselves of the quality". The woodworkers are not old-time shipbuilders. Rather, they are experienced carpenters and cabinetmakers whom Jack Cogswell has trained in the art of shipbuilding. In a large, high-ceilinged room, the wood and fiberglass pieces are joined together. At any given time, about six to eight boats are being assembled on large, wooden blocks. The process is slow and painstaking. The men who are perched on top, inside and around the boats all work on small tasks. They fasten bolts, finish trim, adjust wiring. A visitor to the plant has the impression he is watching a team of independent artisans rather than an assembly line. Credit for construction of the boats must go to Cogswell. He supervises the building and spends 50 percent of his time on the shop floor. Short and husky, with a rather gruff voice and manner, Cogswell is the perfect Mr. Inside. He makes sure the boats are built to his liking. 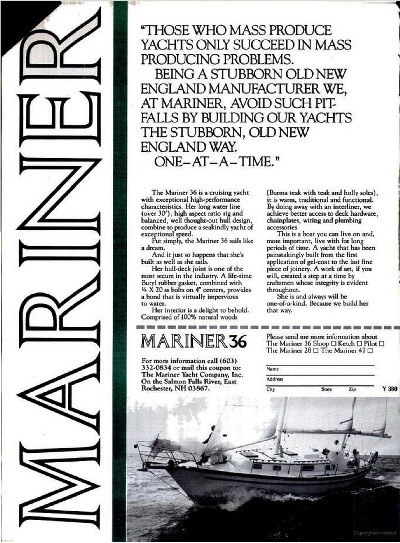 Accidently found this site by Googling "Mariner36". Was quite amazed to find such a well organized site and enthusiastic group of devotees. 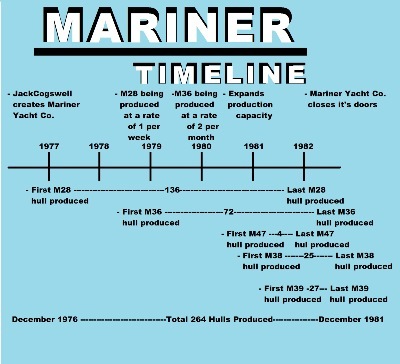 I was involved in the creation of the Mariner 36 back in 1978. I had started working in E. Rochester the E. Rochester plant the year before. The crew was comprised of about 20 people, along with Jack and Mary-Lou Cogswell, the owners. I had know Jack as a kid growing up in Marblehead, MA, when I used to hang around his dock. 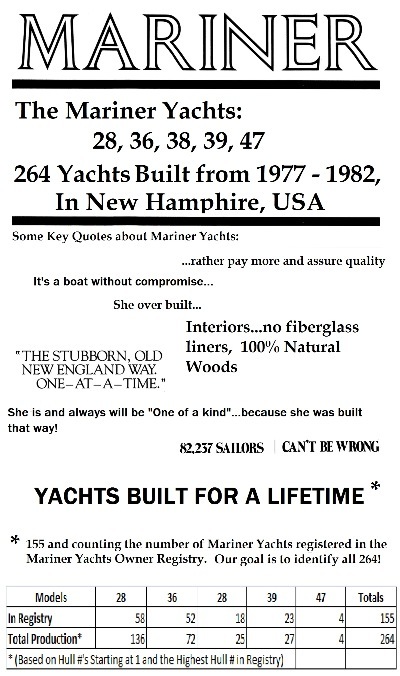 In 1976, two partners and I had formed a small specialty boat shop down the road in E. Kingston NH. When we ran out of orders and money a year later, one of my partners heard about Jack and Mariner. Jack hired us on the spot, putting me in charge of the parts department. Shortly thereafter, Jack put me in charge of building the plugs and molds for the Mariner 36. Naval architect Peter Canning of Connecticut (the original designer) and I lofted the hull in one week. After that I loosely oversaw the rest. We began lofting during the first week of May, 1978 and had the prototype in the water at the Annapolis boat show the first week of October that fall. Slightly over half the crew, by now numbering 25 souls, was still producing one 28 foot boat per week under the direction of John (Butch) Madden. We built everything by hand and in house. We naturally made a few mistakes. OK, more than a few. Those of you with 36 footers will please accept my apologies, I was 23 years old then! We must have done a pretty good job because we took firm orders for one year's production that week in Annapolis! The 28 footer, which had been our mainstay, was still being built in good numbers when production of the 36 ramped up to about 2 per month, I think. At this time I was bouncing around the facility making production improvements, instituting a quality control program, and handling warranty claims. After too long working in boatyards, I parted company (amicably) with Mariner and Jack in '79, returning to college to work on my engineering degree. Mariner survived another few years and would probably still be here today if not for a run of bad luck. Jack's next project was a 42 foot lobster yacht. I've seen a couple of these and they were pretty well done. I'd still like to have one. One of the earliest 42's partially burned up when a workman left a droplight on overnight next to a jug of curing polyester resin. Recovering from this setback, Jack decided to create a sail boat in the 47 foot range catering to the charter trade. The story goes that one customer, ordering several, defaulted in payment and Mariner's finances never recovered. A shame really, since all these models were well thought out boats, designed to last. Admittedly they were heavy, but as this site bears witness, they were designed to last. A few years back I noticed that someone in southern Maine bought the M36 molds and tooling and was producing a few boats. But that's all. I'm still in the boat business and still hear reports Of Jack Cogswell at his restaurant in Boothbay. But that's another story. I'd like to offer my hazy memory of how they were put together, and suggest a few fixes and possible upgrades, but you guys probably know the boats better than I do. I'll check in from time to time.